Sometimes you hold all the stars in your hand. Sometimes the cards are aligned just right. And sometimes you get to be in Door County, Wisconsin, on the most heartbreakingly beautiful day of the summer. Better yet, I got to spend most of the day on Washington and Rock Islands, just off the northern tip of the long peninsula, birding. Melody showed me some really lovely spots and some really exciting birds, and my appetite is decidedly whetted for another visit. It seems like every would-be birding destination in the world touts its “diversity of habitats,” but Door County lives up to the boast. 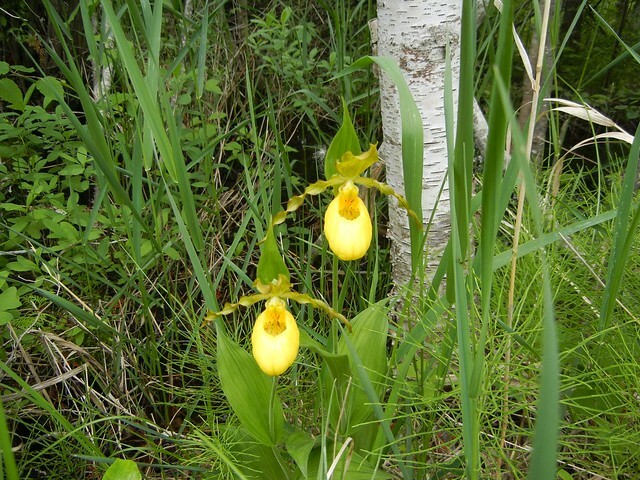 What’s more, those habitats — from hay fields and woodlots to boggy spruce forests and hemlock groves — unite the two great ecological systems that dominate the center of the continent. Here, the dickcissels of the midwestern prairies sing to the black-throated green warblers of the boreal forest. The meeting of north and west is especially obvious out on the water. Not that long ago, American white pelicans were rare birds on the Great Lakes, even in migration. 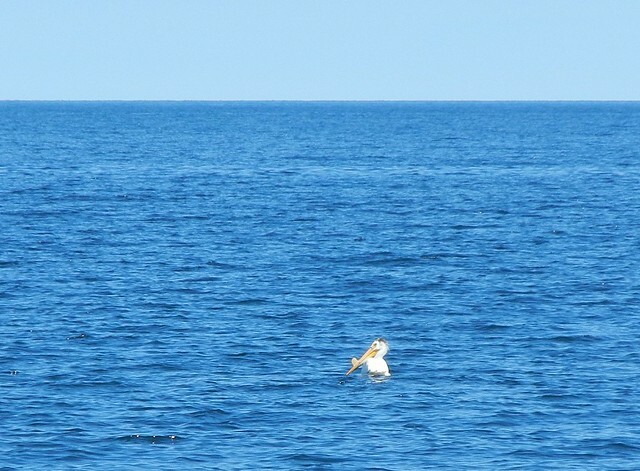 This week, it has been hard not to see these huge, magnificent birds, ones and twos sailing majestically on the waters of the bay and the lake or larger groups — up to 130 at a time — gliding and sailing with equal serenity across the blue skies. These classic birds of western prairie lakes and swales share the blue waters with surprising numbers of red-breasted mergansers. 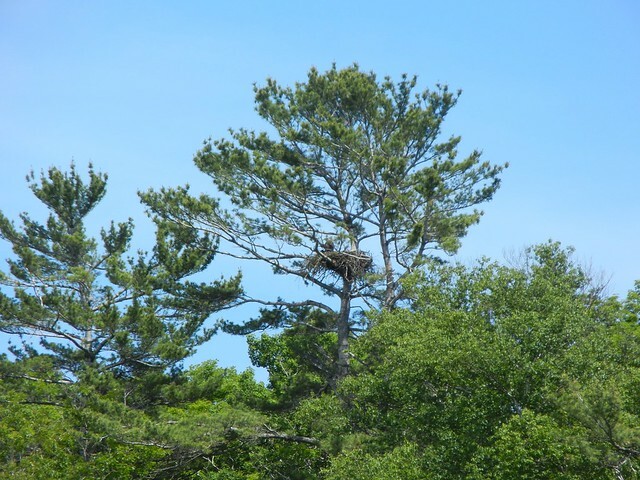 Most seem to be males, suggesting that the waters of Door County are a “molt migration” site for this species; while the females and young linger around the nest, the drakes, their work done for the year, take off for open water and shed their flight feathers in safety. Nearly every bit of shoreline — as here, on Washington Island — seems to have its mergansers, but the biggest flock Melody and I encountered was a whopping 310 birds, loafing and feeding just off Rock Island. The wooded habitats, too, harbor a piquant mix of species. 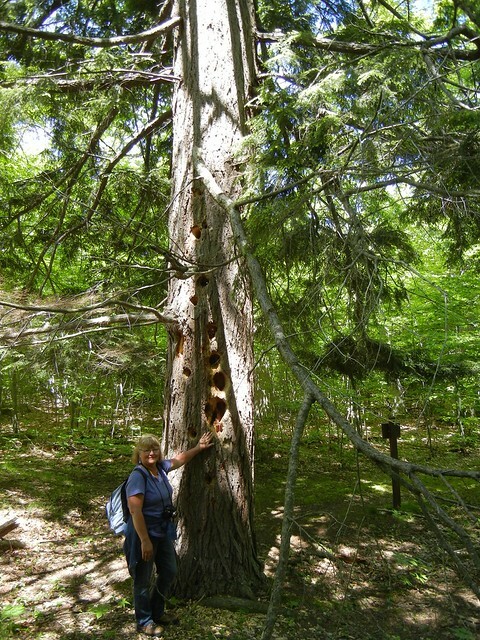 This enormous hemlock is the playground of a pileated woodpecker, a surprisingly common bird in Door County; in fact, with the exception of the ubiquitous northern flickers, I heard and saw more pileateds than any other picid this week. Just a couple of miles away stands a dark, wet deciduous forest, the home of a family of red-headed woodpeckers. Quiet and furtive on a warm afternoon, the birds eluded us on our quick stop, but just knowing they were there, somewhere, made the peninsula a richer place to my mind and eye. 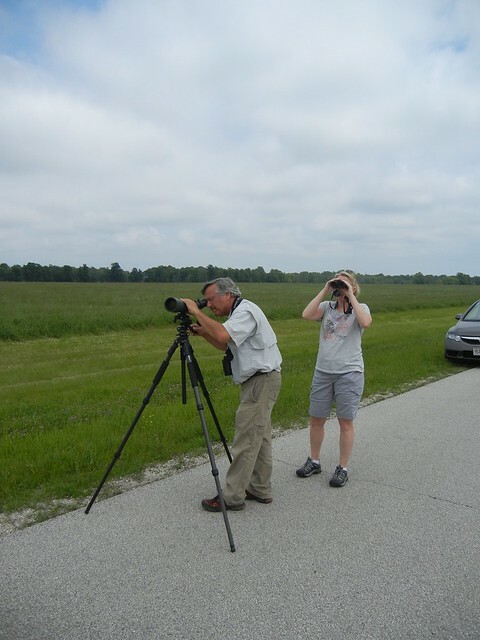 As a slender hint of just how rich Door County is for the birder, have a look at our day list, and note the enticing mix of northern and western and eastern birds you can find there — even in summer. The scenic drama of the Niagara Escarpment, the limestone spine ridging Door County, can hardly be overstated. 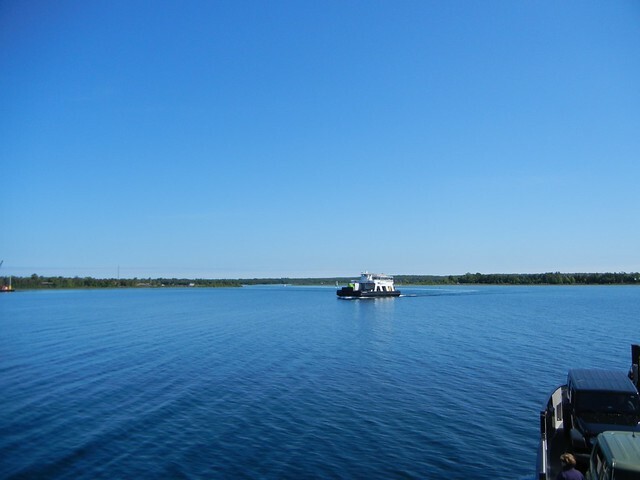 We got to admire it today from land and from water alike, first with a “trolley” ride through Peninsula State Park and then, on a cool and breezy afternoon, from the deck of a boat that took us out towards the Sister Islands and their white haze of ring-billed and herring gulls. Exactly 100 years ago today, on June 26, 1914, R.M. 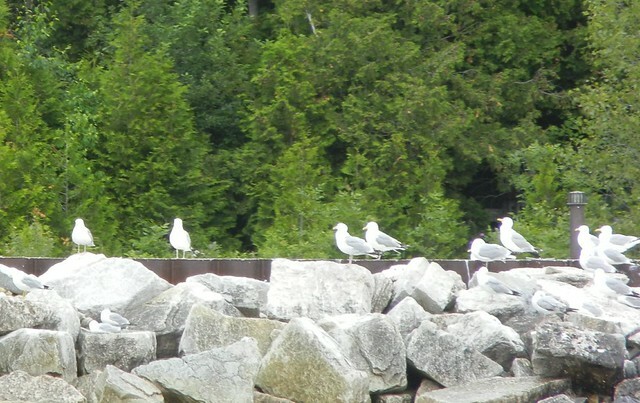 Strong paid his own first visit to the Sisters as part of his study of the herring gulls breeding in Door County. From here, Strong was able to watch the birds pairing, building, incubating, brooding, feeding, and, of course, fighting. Our trip this afternoon confirmed that at least that last component of larid behavior persists. 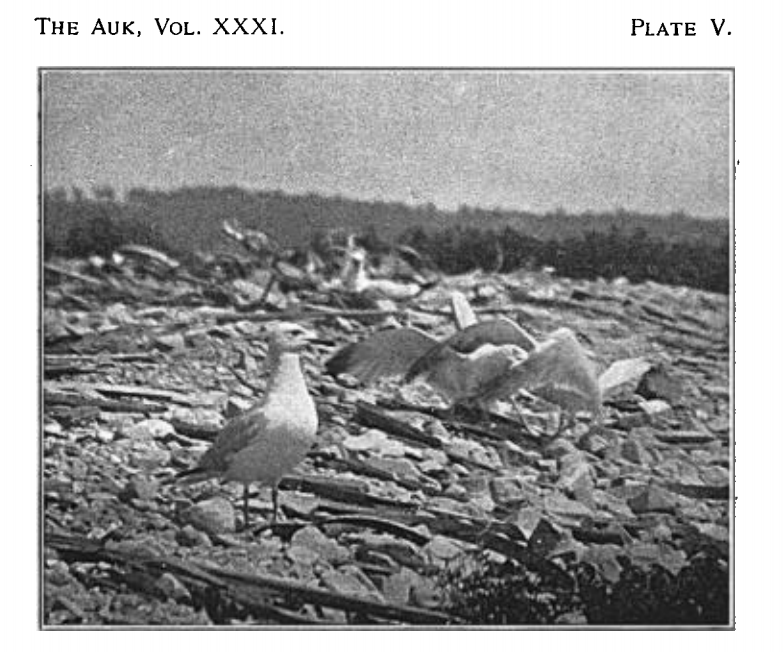 Strong’s experience had taught him that it would useless to try to train gulls captured as adults, so he secured a small corps of chicks of flighted juveniles to work with. His preliminary results were encouraging: the young birds quickly grew tolerant of their human keepers, and herring gulls, he found, could recognize new situations in their environment — the hope was, of course, that they could be taught to recognize submarines and somehow “alert” their human monitors to the threatening presence. by careful watching … variations in their movements would at least suggest that an unusual object was in the water. The plan — of which Strong admitted “that the chances of success were limited, to say the least” — was never carried out. 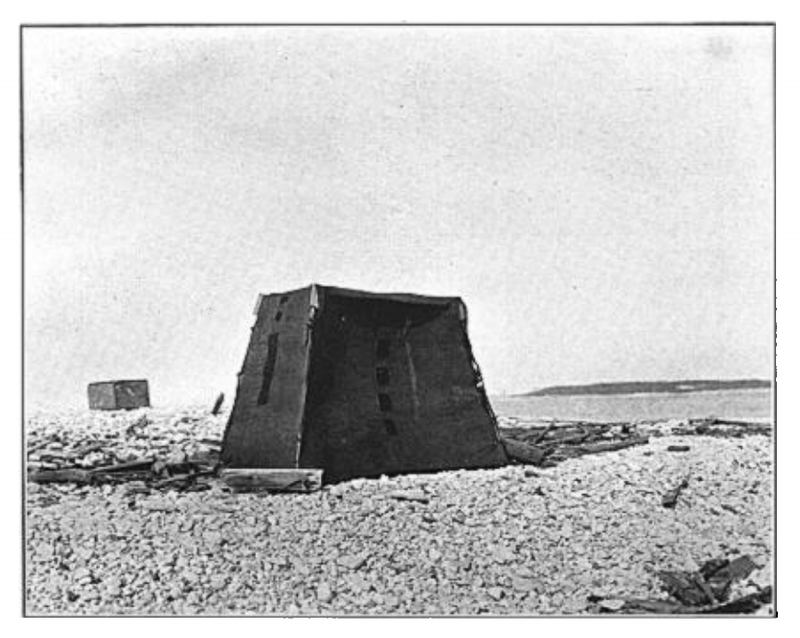 While Strong and his colleagues were working out the details, other, “very efficient methods for detection of submarines were developed,” and the “raid” on the gulls’ nesting colonies was never carried out. The herring gulls of Lake Michigan could go back to their loafing and squabbling, activities they continue to excel in today. 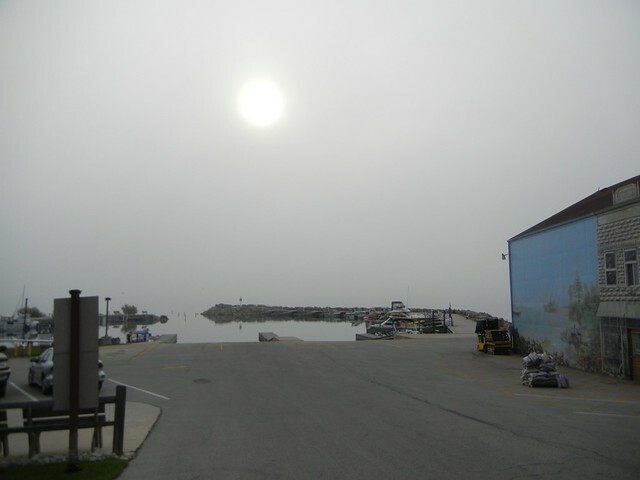 The fog made for an eerie morning here in Baileys Harbor, an impression only heightened by the screeches of invisible Caspian terns over the lake. But nothing can deter birders when they’re in a new place, and after breakfast, Marnie and I met up with Paul for an introduction to some of this long peninsula’s many and varied habitats. We started off on the bayshore of Peninsula State Park, where I was finally able to make sense of that mysterious word “alvar.” A bar far offshore was drifted with American white pelicans, and small groups, family groups, of red-breasted mergansers — a funny bird to see in the summer — dived and flew up and down in front of us. The boggy woods across the road in the park must be great for migrants earlier in the season, and even in late June are surely good for breeding birds earlier in the day. The dominant voices late this morning were red-eyed vireos and American redstarts, with ovenbirds, common yellowthroats, yellow warblers, and a distant Nashville warbler rounding out our parulid list for the site. 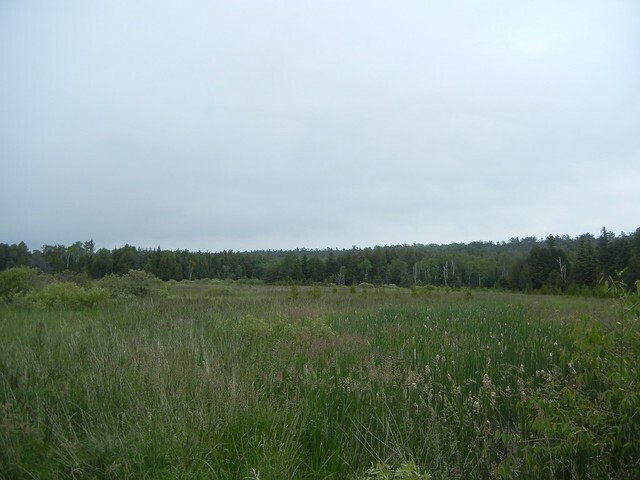 From Peninsula we went on to Mud Lake, approaching along a road that reminded me more of a tamarisk marsh in Maine or New Brunswick than of the Midwest. Delightful as it was to hear an alder flycatcher sneezing out in the alders, the roadside orchids were even more welcome a sight. We looked for but did not see the rare Hine’s emerald, though a couple of other odonate species were flying; Paul identified a corporal, a darner, and a twelve-spotted skimmer. In spite of the overcast, we found pearl crescents, a white admiral, and several mourning cloaks — and impressively vast numbers of the insects the locals call “mosquitoes.” They seem thirstier than the ones I’m used to. We fled the buzzing horde to look for some farmland specialties. Paul knew a bobolink field, so we spent several enjoyable minutes watching the males sing and dance over the tall grass; I got to see one female fly in and land in the grass with something wriggly in her bill, so maybe they can bring off young before the rest of the field is hayed. Savannah sparrows shared the hayfield and perched on the wires, and two male dickcissels buzzed at a frustrating distance before one came closer to the road and sang for us as we pulled away. Over the course of the morning we also found two pairs of sandhill cranes. Paul had been watching this pair, which, he told us, has a large but still flightless chick. The colt must have been hidden in the grass when we arrive — but no complaints about missing it after such a wonderful and quintessentially midwestern morning in the field. I’d driven through Wisconsin once, long ago, on the way to points far west, but Monday marked the first time I’d ever set foot on Badger soil outside of an airport. I like it. 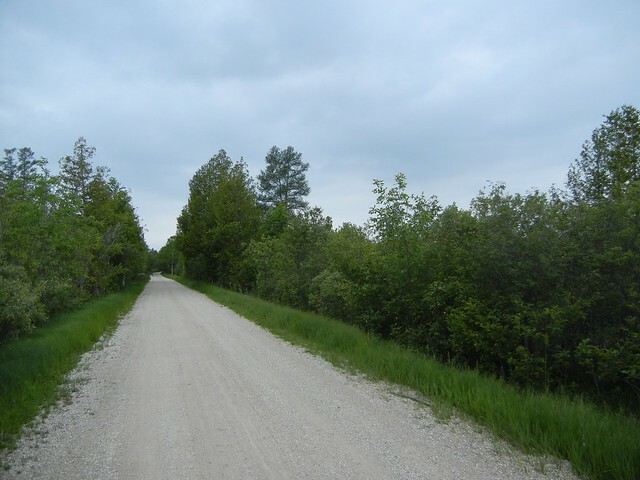 The drive north from Green Bay on that funny pointed peninsula was encouragingly rural, with small farms and fields and orchards lining the roads. Eastern kingbirds and meadowlarks ornamented the fences, and high above it all American white pelicans soared, alternating blinding white with near invisibility as they turned in the sky. I’m staying in Bailey’s Harbor, at the Blacksmith Inn, a quiet and comfortable place right on the water. My little porch looks out at a bit of marsh, noisy with red-winged blackbirds and yellow warblers, and then on to the harbor itself, happy hunting ground for ring-billed and herring gulls and prehistoric-looking Caspian terns. 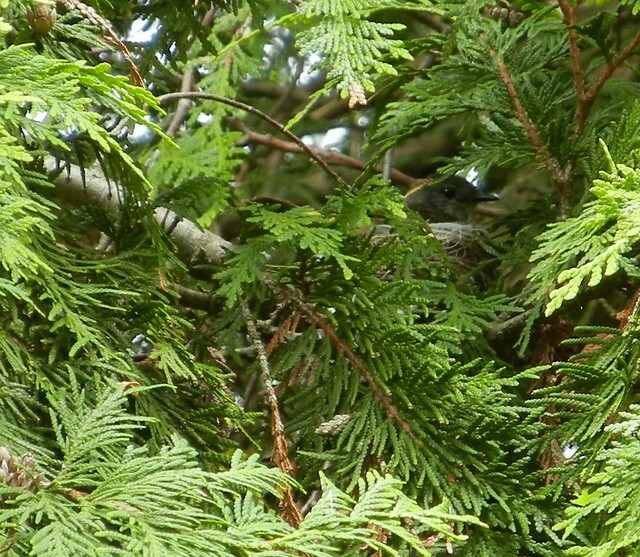 The little yard attracts chipping sparrows and American robins, and a busy American redstart has her nest and her still tiny nestlings in a tree just at the corner. Dinner that first evening was in Fish Creek, an appropriate place, I thought, to have my first Great Lakes perch. The birds had the same inspiration: an adult bald eagle flew over carrying something scaled and struggling, and two black-crowned night-herons flapped past the restaurant windows hoping to catch their own in the dusk.